Strength lies in numbers. Power derives from strength. These two truisms can help you elevate your Christmas light display from the ordinary to the exceptional. Unfortunately, it's a concept that too few Christmas Enthusiasts utilize in designing their light displays. We've noticed a trend as of late. It seems that the go-to color scheme that many Christmas Enthusiasts utilize is simply a jumble of multicolored Christmas lights. Look at the displays going up in your neighborhood right now, and you'll likely notice what we've noticed. 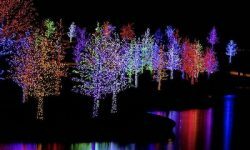 You'll see that most Christmas light displays utilize lots of mixed-color light sets, where each string of lights contains a cacophony of different colors. These same multicolored light strings are often used in decorating all the features of a property: the home, trees and foliage, walkways and driveways, etc. The temptation to do so is understandable. After all, Christmas is the most colorful of holidays. So the more colors in each string of lights, the merrier. Right? 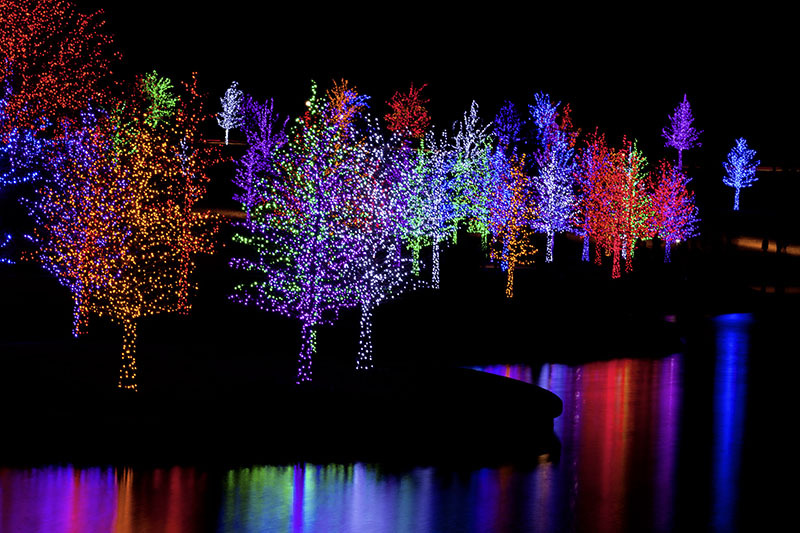 We aren't advising you not to use lots of different colors in designing your Christmas lighting display. Instead, we're suggesting that you consider an alternative method of using all those different colors: color consolidation. Color consolidation taps into the "strength lies in numbers, power derives from strength" philosophy. As you design your Christmas light display for this year, consider utilizing solid blocks of color instead of strings of multicolored lights. Use the solid blocks of color to distinguish individual features - a tree, for example, or an eave line, or a driveway outline. You'll still use multicolored lights in your Christmas display, of course. But the colors will be concentrated rather than scattered and random. Each light line will be of a single color, and each element of your decoration will focus upon a specific color. So perhaps this tree will be all red, while that tree will be all purple. The roof eave will be all green; the walkway bordering will be all white. And so on. These concentrations of color benefit from the powerful visual impact generated by grouping together many individual bulbs of the same color. The result is a very distinctive look. And yet you'll retain the wonderful variation of color that has become associated with Christmas. But the visual impact of each color will be strengthened rather than diluted. You can further intensify the power of color consolidation by going all-LED with your Christmas light display. That's because the colors provided by LED bulbs are bolder and more intense than the colors generated by old-fashioned incandescent bulbs. The reason for this difference is simple: LEDs produce true color; incandescents don't. At the root, all incandescent bulbs are the same color: the bright white light created by electricity coursing through the bulb filament. The different colors of incandescents are created by simply dyeing that white light of the filament glow by masking it with a colored bulb. But LEDs create their color in a very different manner. Each diode within each LED bulb produces the true color of the bulb. If the bulb is a red bulb, for example, the bulb's diodes produce light on the red wavelength of the color spectrum. Compare two bulbs of the same color - one LED, and one incandescent - and you'll see that the difference in color purity and intensity can really be quite dramatic. Imagine that intensity and color purity multiplied by the thousands of bulbs in a Christmas display. It makes a difference. It's a simple matter of fact that many Christmas displays look quite alike these days. Cookie cutter. That doesn't mean that those cookie cutter displays are bad. But they just don't stand out much. They don't offer much originality or individuality. If you've seen one of those displays, you've pretty much seen them all. If you want to break from the pack with your Christmas display, consider tapping into the power of color consolidation. It's a great way to stand apart from the crowd with your Christmas decorations. And isn't that really the goal?